Click the logo and a new window will open that takes you through the rest of the Yandex authorization process. After you complete the steps described below, you will be able to log in to Yandex just by clicking the Facebook logo. Log in to your social network if you have not signed in yet using your current browser. Allow access to your public data if Yandex was not previously aware of your Facebook account. Create a new Yandex account To do so, just click I'm a new user. You can always create a username and password for the new account. A username is necessary, for example, to use Mail. Your Facebook account will appear on the Социальные профили page in Yandex.Passport, and your Yandex services will display the name you use on your social media profile. Why should I have a Yandex username and password? 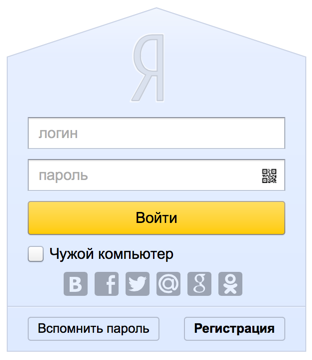 What should I do if I forgot my social network password and can't log in to Yandex services? Is it safe to log in from a social network? You may need a Yandex username and password to use certain services, such as Mail or Disk. If you log in to Yandex from a social network, you are given the option to create a Yandex username and password. 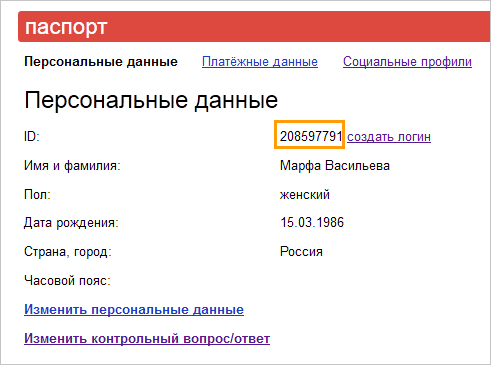 Yandex does not know your social network password. If you forgot this password and you do not have a Yandex username, try recovering your password on the social networking site. If your social network account is associated with a Yandex account that you created a password for, try restoring access in Yandex.Passport. If a Yandex employee needs your username to solve a problem, but you have not yet created a username, just copy the following number: Personal information. Log in to your Yandex account via your social profile does not expose the latter to security vulnerabilities. You do not need to tell Yandex your social network password; you only need to allow Yandex to access the most basic information about you. Additionally, you can withdraw Yandex's access to your profile at any time by just deleting it: Социальные профили..
Why should I have a Yandex username and password?What should I do if I forgot my social network password and can't log in to Yandex services?How to find the ID number that a Yandex Support representative will ask forIs it safe to log in from a social network?